Create a luxurious, spa-like experience in your bathroom by centering it around the BW-09. This sleek and contemporary freestanding bathtub features an oval design with an elevated side for an inviting look. 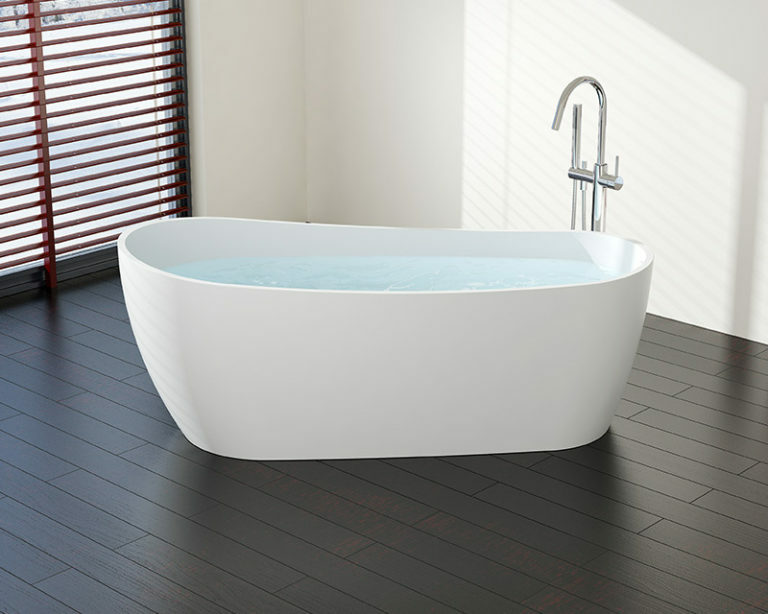 A slight taper to the inside of the tub allows you to lean back in comfort and allow the water to cover your body. The included pop-up drain is conveniently located at the foot of the tub and comes in a full range of finish options, making it easy to coordinate the drain with the rest of the hardware finishes in your bathroom. Every aspect of this modern bathtub is crafted with quality in mind. It all starts with a durable, eco-friendly material called stone resin. This non-toxic and non-porous material holds up to moisture and humidity while offering amazing heat retention abilities. This material comes in your choice of a matte white or glossy white finish, both of which offer a crisp, clean look that coordinates with your bathroom decor. This tapered, free-standing bathtub is intended for use with a floor-mounted faucet or a wall-mounted faucet, enhancing the contemporary look. We just started our home remodel project and are tackling the kitchen, 2 existing bathrooms in addition to building a ma…ster suite with a new bathroom. I wanted to make sure we brought a “spa-like” environment to our master suite bath. We found Badeloft and instantly fell in love with their soaking tubs. My husband and I are both very tall so we wanted something that we could totally relax in. I was leaning more towards a jetted tub but once I was able to see them in their new showroom (note: check it out if you are near the SF area! ), I knew I couldn’t live without one. We decided on the matte finish, it is absolutely gorgeous and we get compliments on it all the time. A huge plus was that they sent us a template that we were able to lay out on the floor to play with the tub position. We ended up going with a place that we would have never envisioned without that. Looking forward to the final days of this project! We purchased the tub in February for the major remodel of our master bath. My wife and are are very happy with the finis…hed product. It went in very easy. We looked at various less expensive tubs but made the decision to purchase the Badeloft tub. The delivery process went very well. We decided to hire a moving company to get the tub up to the second floor which I would recommend if you have similar location. This has to be one of the most comfortable and stylish freestanding bathtubs I have ever had. The customer service has b…een excellent. The quality of the bath is excellent. Love it!